Microsoft has announced an overhaul to its Windows Live Essentials service, offering significant updates to a number of its features – including: Windows Live Photo Gallery, Movie Maker, Mail, Messenger and the addition of Windows Live Sync. Microsoft is embracing the cloud with this update, offering more synchronisation and sharing than ever before. The computer company is also helping users climb over its walled garden by adding official upload links to a number of sites, including Facebook and YouTube. To help you better understand the new features within the Photo Gallery, and Mail parts of Windows Live Essentials, we have compiled a list of our essential parts of, well, Essentials. Ever had two so-so images that you wished you could combine to make an awesome one? Well, now you can – courtesy of Essentials' Photo Fuse feature. Having seen this in action, the outcome is pretty impressive, banishing closed eyes and wonky smiles forever. This can't really be classed as a new feature, given it's on every camera in the market at the moment but Essentials uses the technology to good effect, allowing you to group photos by people's mugshots. While it's not 100 per cent perfect – people wearing caps puts it off of its stride – it does work well and you can always manually add names to it, so the face recognition software will remember for next time. As we explained in our look at the new Messenger, Microsoft is softening its approach to sharing, adding official links to other sites that aren't owned by Ballmer and co. Shock and indeed horror, as this means that users now have one-click uploads for images and the like to Flickr, YouTube or Facebook. 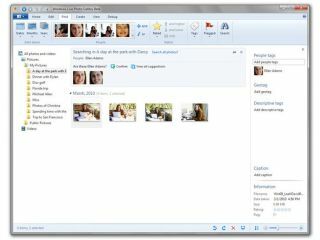 You can also, obviously, add them to SkyDrive. Messenger has been set free from Microsoft and can now be used within Mail. This means that you don't have to have a load of, er, windows up at once – you can log into Messenger straight from your inbox and try and speak live to the person you are emailing.